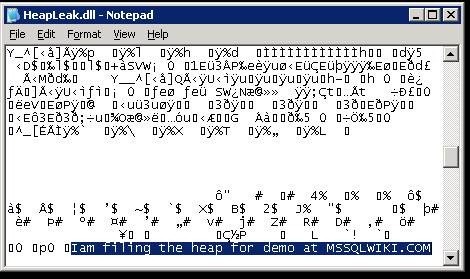 This entry was posted on December 4, 2012 at 2:02 PM	and is filed under Debugging, Memory, Performance, SQL General, SQL Server Engine. Tagged: memory leak, Memory leaks in SQL Server, MTL erros in SQL Server, sqlserver memory, tracking memory leaks in SQL Server. You can follow any responses to this entry through the RSS 2.0 feed. You can leave a response, or trackback from your own site. Semma usefull post ! Thanks kartick. When I exec HeapLeak once , I found the committed Size increase by 10M, but working set Size only increased by 4M by tool VMMap, why? BTW, can you public the source code for the DLL HeapLeak? That is because remaining 6 MB is paged. I will share the source code. thank you so much Karthick, you are so kind. blogs I stumbleupon on a daily basis. It will always be helpful to read articles from other writers and use something from their sites. to manually code with HTML. I’m starting a blog soon but have no coding skills so I wanted to get guidance from someone with experience. Any help would be enormously appreciated! Fantastic site you have here but I was curious if you knew of any community forums that cover the same topics discussed here? I’d really like to be a part of community where I can get comments from other experienced individuals that share the same interest. If you have any recommendations, please let me know. Many thanks! this. You must continue your writing. I’m confident, you have a huge readers’ base already! The article offers proven useful to me personally. It’s really useful and you’re certainly quite experienced in this field. You have opened up my own eyes to various thoughts about this kind of matter along with intriguing and reliable content material. Thank уouu for the good writeup. It in fact was a amusement account it. way, how couρd we communicate? remedial repair work, painting and decorating. twenty-four hours a day loan deals. blkog before but after reading throuugh some of tthe post I realied it’s new to me. be bookmarking and checking badk often! lot. I used to be looking for this certain info for a very lengthy time. Hi, Can we skip some LSN to roll forwd datamirroring setup which stop at certain point.